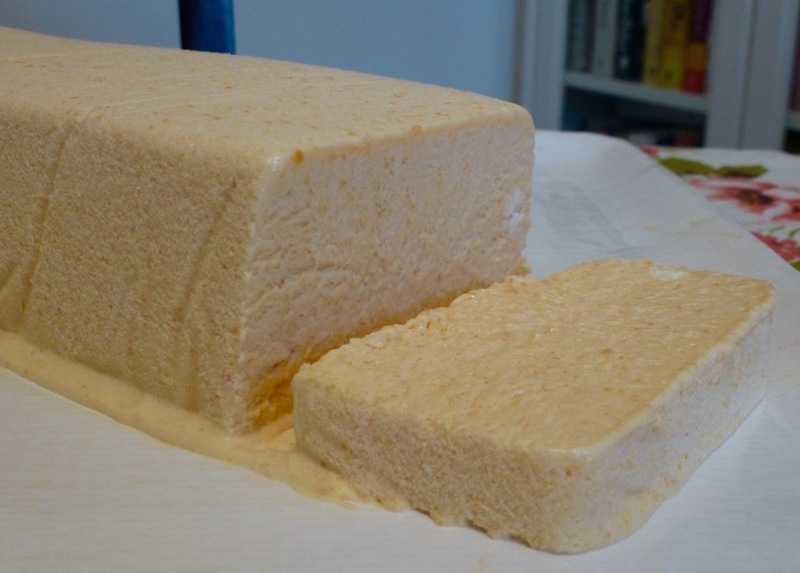 Semifreddo, an Italian frozen mousse, is a great make-ahead summer dessert. I posted a sour cherry version when I first began blogging. This apricot semifreddo is light and refreshing on a hot day, can be made several days in advance, and will keep in the freezer for at least a week. You can poach good quality fresh apricots or use canned apricots if fresh are not available to you. I recently made this dessert for a family gathering and everyone loved it. If you are concerned about using raw eggs, feel free to use pasteurized egg products or cook the apricot mixture in a double boiler. In a 2-quart saucepan combine water, sugar, and extract. Bring to a boil to dissolve sugar, then lower heat to a simmer and add apricot halves. Let simmer until apricots are soft, depending on the ripeness of the fruit, 3-5 minutes. Remove apricots with a slotted spoon. Discard the poaching liquid. You will need 1-1/4 cups poached apricots for the semifreddo. Line a loaf pan with parchment or waxed paper, enough to overlap the edges of the pan. In a blender combine apricots, jam, 1/2 cup sugar, extracts, and salt. Blend. Taste and see if it is sweet. Add more sugar if the apricots seem a bit too tart, then add the egg yolks. Blend until smooth. Pour into a large mixing bowl. In a separate mixing bowl beat egg whites with a pinch of salt until stiff. Fold whites gently into the apricot fruit mixture. Beat cream to soft peaks with the 3 remaining Tablespoons of sugar. Fold into fruit mixture, then pour into prepared pan. Fold extra parchment or waxed paper over mousse. Place in a large ziplock bag or cover with plastic wrap and freeze. When ready to serve, unfold parchment and cut into slices. Serves 8-10. This entry was posted in Custards, Desserts, Fruit, Ice Cream. Bookmark the permalink.